Article produced by The Revd Dr Jonathan Holmes, Keeper of the Records. Please click on the link above to see the First World War Roll of Honour. The majority of undergraduates joined the Army in the recruiting boom of the autumn of 1914 and early 1915. Many of those students who matriculated in the Michaelmas Term of 1914 joined up within days or weeks. The Dial for the Michaelmas Term 1914 lists 142 Queens’ men already known to be serving in the Forces. Other young men with places at Cambridge did not come up for the start of term as they had already enlisted soon after Britain’s declaration of war on 4th August. By early 1915 there were few students in residence. For the University as a whole, there were 3,181 undergraduates in the Easter Term 1914, but only 491 in the Easter Term 1917. Those left were of three groups: recent school leavers who were too young to enlist, foreign students and those of lower medical grades who were unable to join up – ‘Infants, Internationals and Invalids’ according to soldiers training in Cambridge. *The Vice-President wrote this in the Matriculation Book “The above entries, thirty-five in number (all that are left of sixty), were made by me this 28th day of October 1914. Bella, horrida bella”. This is a quote from Virgil, Aeneid 6.86-7: ‘Bella, horrida bella,/et Thybrim multo spumantem sanguine cerno’ (I see wars, horrendous wars, and Tiber foaming with much blood). Basil Montgomery Coates was born on 10th September 1893, the son of William Coates (1857-1912), Lecturer in Mathematics at Queens’ and Senior Bursar. He was educated at the King’s Choir School and the Perse School in Cambridge, then at Oundle School. He came up to Queens’ in 1912 to study for a career in medicine. However, he was a member of the Officers’ Training Corps and so volunteered for the Army in 1914. He went to France in the early summer of 1915, serving at the front in the Ypres Salient as a Second Lieutenant in the 10th Battalion of the Rifle Brigade (The Prince Consort’s Own). He soon established a reputation for going out on patrol – according to his commanding officer he was “our best scout and absolutely fearless and had already obtained valuable information”. On 7th September 1915 he went forward to scout enemy lines and was killed within about 80 yards of the German trenches. There is no known grave. In letters to his mother or to Oundle, fellow officers described Basil Coates as “always cheerful and considerate”, “so good natured and (with) such a charming manner”, “one of the bravest men I have known”, “everyone was very fond of him”. He is commemorated on the Ploegsteert Memorial in Belgium and also at Queens’, in St Mark’s, Newnham, at the Cambridge Guildhall, at the Perse, and at Oundle. Basil Coates’s older sister Kathleen was educated at the Perse High School for Girls and then, from 1909, read Modern Languages at Girton College. She had to take a year out because of illness, thus eventually coinciding with her brother as an undergraduate. She specialised in French, taking the MML Tripos Part I in 1912 and Part II in 1914. In 1918 she published a collection of poems entitled Lost City Verses, many of them expressing her grief and sense of loss on remembrance of her brother. In 1917 she had married a Canadian soldier, Major James Hill Wallace, attached to the Canadian Mounted Rifles. After the War they spent some time in his native Ontario before going to China for several years. The family (she and Major Wallace had four sons) returned to England in 1927. Her China experiences were the inspiration for a series of novels set in China, published between 1930 and 1938, of which the most successful was Ancestral Tablet, 1938. There were also novels set in Cambridge, including Grace on their Doorstep, And after that the Dark, and Time changes the Tune, the last published in 1948. In all she wrote over 20 novels including two quite notable fictionalised biographies, Immortal Wheat (about the Brontës) and This is Your Home (about Mary Kingsley). In later life she became quite a successful writer of children’s stories. Her obituary in The Times said of the novels that they were “pleasant and easy to read”. Kathleen died in 1958 (The Times put her age at 76, but she was in fact only 68). Some of the poems she published in 1918 show the rawness of her loss and give the reader a sense of what it was like for those ‘on the home front’ as news of the casualties came in. The last note shrills, and the curtain runs. Stiff and still in the bitter weather. What do they mean, their words that throng so loud? Stale tenderness, made foolish suddenly. We who lived love, will not see love grow old. No, nor clutch wisdom as a thing to save. Untouched, unbroken, unrebuilt, our dream. All into wonder and a breathless maze. I wonder if you hear? I wonder if you know the winds are out? Like spires out of the mist at the day’s edge. Careering through the dusk into the town. Running red flame behind the spires of King’s. Just as they come to me, alone, tonight. When the glad winds raced under Cambridge walls. Early in 1916 Cambridge became (until 1919) the leading venue for training junior army officers in the country. Queens’ and Pembroke were at the very centre of this vital part of the war effort. Following the declaration of war, the Vice-Chancellor of Cambridge University had been empowered to place all grounds and buildings of the colleges at the disposal of the War Office. For example, 1st Eastern General Hospital was built from huts on the cricket grounds of King’s and Clare College off Queen’s Road (where the University Library now stands) and would care for many of the wounded sent home from the Western Front. Kitchener’s massive expansion of the Army in late 1914 required large numbers of officers to lead the new units. Thousands of university and public school men – many of whom had prior service in a school or university Officer Training Corps (OTC) – were granted immediate commissions. These ‘temporary officers’ were expected to fill in any gaps in their military knowledge by learning on the job. By December 1914, it had been recognised that thousands of potential officers were serving in the ranks, ‘so it was decided that NCOs and other ranks who were recommended by their commanding officers would be given a short course of officer training for four weeks’. This training was to be carried out by Territorial units such as the various university OTCs (which by then had few undergraduates to train), and, if suitable, the candidates were commissioned. Cambridge University OTC (CUOTC) was one such unit, and it set up the ‘Cambridge University School of Instruction’ at Pembroke. 11 courses were held at the School of Instruction between December 1914 and February 1916 and ‘a total of 3,744 officers passed through the school. However, by the autumn of 1915 it was apparent that this ad hoc way of training officers – where they still had to learn many of the basics ‘on the job’ – was hopelessly inadequate. The rapid expansion of the Army combined with steady casualties meant that men with military experience were thinly spread. This was particularly true of units in Kitchener’s New Armies and the Territorials. So, in February 1916, a more comprehensive training scheme for officers was set up with the formation of the Officer Cadet Battalions (OCBs) which provided a four-month course. A total of 24 OCBs were formed, the first twelve by June 1916 with at least six more by December 1916 and the remainder by July 1917. Cambridge was home to three OCBs: No. 2 based at Pembroke, No. 5 based at Trinity and the Garrison OCB (later No. 22) which was based at Jesus. The latter was formed to train officers for the home defence units which were guarding the East coast against the threat of German invasion and raiding activity and consisted of men of lower medical grades who were not fit for service overseas. A candidate for a commission had to be recommended by his commanding officer. Once he had been accepted he would be posted a few weeks later to one of the OCBs. Pembroke was the obvious choice to be headquarters of No. 2 OCB. Given that the staff of CUOTC were running the skeleton of CUOTC as well as the School of Instruction from the Old Library, it was merely a matter of expanding the School of Instruction and converting it into an OCB. Lt-Col HJ Edwards, the 46 year-old Commanding Officer of CUOTC and Senior Tutor at Peterhouse was thus appointed as CO of No. 2 OCB. The battalion consisted of five (later six) companies, each of 4 platoons of about 30 men. The companies were billeted in Queens’ (‘A’ Company), Pembroke (‘B’ Company), Emmanuel (‘C’ Company), Corpus Christi (‘D’ Company), Peterhouse and Downing (‘E’ Company). ‘F’ Company was established a few months later and was based at Christ’s until September 1917 when it moved to Ridley Hall. The total strength of the battalion across all the colleges averaged around 800 men, although a peak strength of over 1,200 was attained in May 1917. Officer cadets in Cambridge were not members of the University or of the colleges in which they were billeted. They did not matriculate nor receive any formal academic qualification. The War Office was effectively renting the colleges – not unlike a conference would today – but for the duration of the war. Academic staff of the University lamented the silence which had befallen their colleges before the arrival of the cadets. HF Stewart, The Dean of St Johns wrote in a cadet journal: “A Cambridge college does not exist entirely for the sake of its undergraduates …” but “without its junior members it hardly lives a life worth having. … the college needs young blood in order that it may truly live.” With the arrival of the cadets “our pulse began to beat again. Young men were moving among us once more; the Hall was filled thrice a day; some lecture rooms resumed their uses for instruction and smoking concerts.” It is likely that the President and Fellows of Queens’ had similar sentiments. Probably for this reason, the cadets were not discouraged from thinking of themselves as quasi members of the colleges in which they were billeted. The journals of the Cambridge OCBs usually contain a welcome from the respective Master or Dean encouraging them to think of the college as ‘theirs’ and to enjoy the facilities. 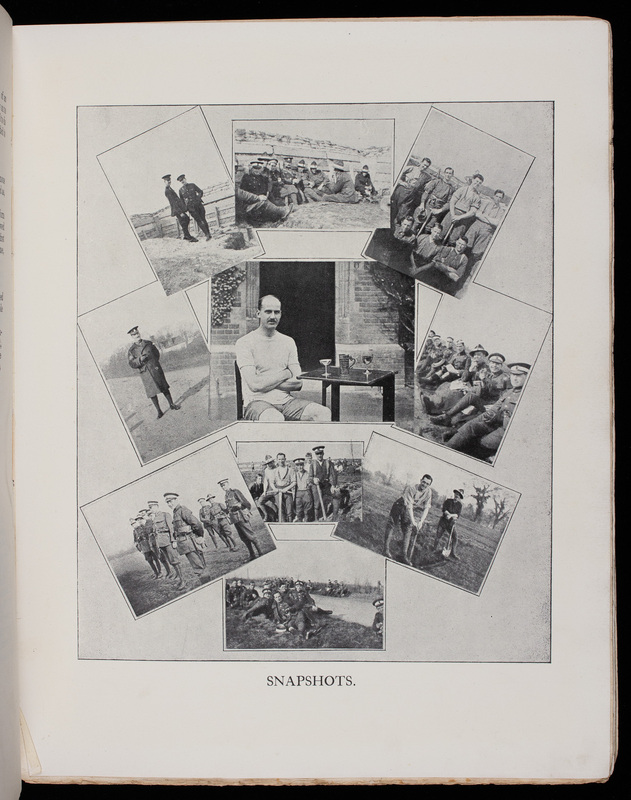 Most of the OCBs published magazines or journals and the cadets were actively involved in their editorial and publication. These sources allow us to build a picture of life as an officer cadet. The magazines and journals produced by OCBs are close cousins of the ‘trench newspapers’ produced on the fighting fronts. An OCB’s magazine would typically be published at the end of the course as a souvenir and would often contain details of cadets’ regiments and addresses so that they could keep in touch. Every company in No. 2 OCB produced its own journal for at least one of the courses. The magazine appears to have been funded through advertising, with many local businesses and even London-based outfitters placing copy. A unique feature of the magazine is an advert placed by the High Commissioner of New Zealand touting for colonists and visitors and a similar one from New South Wales. There are photographs of the cadets at work under instruction and at leisure and a whole series of sports team photographs – ‘Rugger’, ‘Soccer’, ‘The Runners’, ‘The Boxers’ and comments on Tennis and Rowing, even a Choir. Finally there is a list of the participants, each with a note of their Regiment, a little personal comment and a home address so the participants could keep in touch. The majority of the cadets were veterans with a few months or even years of active service. Many had been awarded gallantry decorations whilst in the ranks. A minority were public or grammar school boys who had just left school. Many of the instructors were veterans of the Western Front recovering from serious wounds. Others were ex-scholars with military backgrounds, for instance in public school OTCs, Reserve Officers too old to fight. The company structure was completed by a number of senior NCOs who were usually regular soldiers. On arrival at an OCB the new cadets took off all badges of rank. They were given a white band to put around their caps, and a numeral – a brass ‘2’ – to replace their cap badge. This rendered all cadets equal, regardless of whether they had been fresh-faced schoolboys or battle-hardened senior NCOs. The cadets were billeted two or three to room, a far cry from the dozens that would have shared a barrack room in basic training. The OCBs ‘endeavoured to generate something of the peacetime atmosphere of university life.’ Whilst military training formed the core, several afternoons a week were typically devoted to sport, and the cadets had sufficient spare time to take part in theatre and musical activities. The syllabus for the OCB course in 1916 included training in map-reading, musketry, anti-gas measures, reconnaissance, open warfare, bombing, field engineering (including the siting and laying out of trenches and the construction of tunnels and dug-outs), ‘interior economy’ (which covered a variety of logistical and administrative topics) and military law. Reveille was at 6 am, and was followed by Physical Training in Coe Fen from 7 till 8. This might be followed by lectures, drill, musketry on firing ranges or field exercises. In order to support delivery of lectures, No. 2 OCB constructed a short length of trench in the grounds of The Leys School in Cambridge. Field exercises became increasingly important in the third and fourth months of the course. There was a training area on the Gog Magog hills with an extensive trench system. The cadets marched there for instruction and practice in digging trenches, as well as lectures and practice in both attack and defence. Over the years the training evolved to include, for instance, working alongside tanks following the first use of this new weapon on the Somme on 15 September 1916. Dummy tanks – consisting of a canvas frame mounted on bicycle wheels, with broom handles for guns – were used in the Gog Magog training area. Many valuable lessons were learned during the bloody Somme campaign of 1916 and the infantry tactics which evolved were distilled into a pamphlet SS 143 Instructions for the Training of Platoons for Offensive Action which was published in February 1917. This document recognised the devolution of decision making to the most junior officers who, in 1917, were expected to demonstrate levels of initiative and autonomy that had not been expected of men commissioned before the Somme. The OCBs were instrumental in instilling this initiative into their charges. Cadets were continuously assessed during the course. Field exercises and drilling squads of fellow cadets were used to assess their capability in command roles. Cadets also had to pass three exams which covered all of the subjects such as military law, field engineering and musketry. The exams were set centrally by the War Office each month and would be sat by all cadets passing out of all the OCBs in that particular month. A cadet who failed to be recommended for a commission was returned to his unit with the rank he had held when he left it. Thousands of officer cadets were training with the OCBs at the time of the Armistice in November 1918. Most would have wanted to be demobilised as soon as possible, many being either long serving or in critical occupations. The War Office gave all officer cadets who had enlisted for the duration a choice at the end of December 1918. One option was to return to their units ‘in order to continue to serve in their present ranks’. However, this meant that demobilisation would be at an uncertain date in the future. The alternative was to continue their training with ‘a view to being recommended for a commission’, and then being commissioned and immediately demobilised and discharged to the reserves without ever serving as an officer. It appears that most cadets took this option. No. 2 OCB was wound down in mid-January 1919. Cadets who had not completed their courses were sent to another OCB for their final exams and assessment. Robert Graves considered that the OCBs “saved the Army in France from becoming a mere rabble”. He wrote that “few of the new officers were now gentlemen” but that “their deficiency in manners was amply compensated for by their greater efficiency in action”. By ensuring a consistently good minimum standard of junior leadership, the OCBs played a vital part in the professionalisation of the British Army, and thence the final victory in 1918. Not only did the OCBs ensure adequate quality, they also provided quantity. Despite the horrendous casualties among junior officers, they were present in greater numbers in the typical British infantry battalion in 1918 than they had been in 1914. The “Curfew” bell rings out its nightly peal again – and thereby hangs a tale. It tolls the knell of many other things of the past beside the restriction which has checked its voice for four years. But the parable needs no interpretation. The fact is too stupendous. Never has The Dial appeared in such a momentous era. In sooth we are seeing history in the making… But the history of the war is not written yet, even on the stern face of time, and in the unlettered book of the ages. Nay, further we are more than ever now in the melting pot. There was but now one clear aim of all efforts – to crush the monstrous Eagle; a veritable Hydra lurks beneath the oft-repeated word “reconstruction”. Yet without forgetting what lies before us, we can rejoice at what lies behind, to remain there for ever. And now our hopes are high as the gloomy days recede, and we look forward to the return of those pre-war conditions here which were wholesome. We are set to work again, chastened… Already our numbers are augmenting and every new term will bring fresh increase. Our real college life will begin anew in its fullness and the broken strands of tradition will be gathered up and, interwoven with the fresh and better experience, will form the old fabric, yet new; a thing purged but not to destruction. There will be one more and final War List: a plain record of golden deeds unsung: let it be…the key that unlocks the mystery that, whereas we were slaying and being slain, now, though through slaughter and sacrifice, Peace has been brought within sight. ‘Rest after toil’, said a Cambridge poet, ‘doth greatly please’. Maybe he thus expressed his feelings as he reclined on the Backs or in whatever in Elizabethan days offered the attraction of a punt, endeavouring to realise that the Tripos fiend had done its worst... And there is no rest like that which follows after this, like ‘port after stormie seas’. It befel, as I rested thus… visions of the past ‘came stepping to rear through my mind’. Methought I saw this Ancient University - five years ago is ancient history – in the full vigour of its teeming life. There were men, men, men. Some were votaries of the muse, fat volumes reposed under their arms, as they pursued their way through this seminary of sound learning, unobtrusive meek. To others the field or the river was an only joy, they played and became strong and merry withal... Others again divided their favours … these were they whom they called ‘all-round’ men. There was a cult of Mars, dubbed O.T.C. [Officers Training Corps - ed], but he didn’t matter much. Till one day, all was changed. Vainly I looked for books or bats. The scene is all animation, of men about their business in deadly earnest. I thought when I awoke of August 1914. Then came the changes thick and fast. Alma Mater began her sorrows as son after son was lost – some for a while, too many never to return. Many were her foster sons. Thousands of troops found themselves in her precincts: officers filled her colleges. Another picture: the officers have gone and a cadet school flourishes in their place. The white-banded cap is ubiquitous, the absence of the gown is equally conspicuous. But these poor visions receded in their turn and gave place to happier ones. I heard many bells ringing and many shouting crowds surging through beflagged streets. The beginning of the end … was thus joyfully received. From that scene onwards each one was brighter and filled with more figures. Still they came from near and far till scarce room remained for the mass of sons returning. Khaki has been doffed and all things abnormal have been dwindling away… before the attacks of keen spirits eager to return to the good days of yore. The lean days are over and the future is full of promise. Our guests no longer learn the art of killing but pursue with us, Naval Officers and Americans alike, the paths of sport and learning, and they are most welcome. Once more the cult of Father Camus [i.e. rowing on the Cam – ed] claims scores of ardent devotees and after this long lapse a May Week program [sic] is again before us, with its races and concerts and indifferent weather. … ‘The spirit of the place’ is rekindling its flame and next term the fever of these exciting and uncertain times will no longer be an excuse for any lack of esprit de corps: the College life, we can safely predict, will return to its former proportions. “Peace after War does greatly please”. He was responsible for and contributed himself generously to the restoration of the College in 1910-11. Victorian ‘battlements’ were removed from Old Court and the President’s Lodge renovated, exposing the timbers to give the famous half-timbered building its modern appearance. In 1912 he married Annie Rosa Cook, herself a generous benefactor to the College. A man of simple tastes and habits, his one luxury was mountaineering, a hobby far from fashionable in the late nineteenth century. He particularly enjoyed climbing in the Swiss Alps. He was “a good mountaineer, especially on rocks, very quick and very active, and an inexperienced man found it difficult at times to follow in the footsteps of his guide or to share his enthusiasm for a long expedition every day, sometimes without much regard for the weather…” He enjoyed summer climbing holidays for many years. Later he and his wife travelled to Palestine, Greece, Algeria and even South America, happily camping in the open air if need be – the sort of holidays which were very uncommon in that era. He was noted for his generosity both to friends and colleagues and to his two colleges – he was a major benefactor of Queens’. In 1914, perhaps with prescience, Dr Wright wrote this in the Matricualtion Book “The above entries, thirty-five in number (all that are left of sixty), were made by me this 28th day of October 1914. Bella, horrida bella”. This is a quote from Virgil, Aeneid 6.86-7: ‘Bella, horrida bella,/et Thybrim multo spumantem sanguine cerno’ (I see wars, horrendous wars, and Tiber foaming with much blood). Charles Travers Wood was a graduate of Pembroke College. He won a raft of University prizes in Classics, Theology and Hebrew and was appointed a Fellow of Queens’ in 1900 to be Chaplain and Theological and Hebrew Lecturer. In 1907 he became Dean, a post he was to hold until 1940. He continued then as a Fellow of Queens’ and as Rector of St Botolph’s Church until his death in 1961 at the age of 86. He was a strong supporter of the Scouting movement. After General Robert Baden-Powell’s famous book, “Scouting for Boys” was published in 1907, groups of boys (and girls) all over the country started forming themselves into Scout troops and persuaded adults to become leaders. Leonard Spiller (1909) brought the Scouting fever to Queens’ and that winter seven Queens’ undergraduates started a troop in the Barnwell area of the city. The Boy Scouts Association was officially founded in 1910. Charlie Wood became the first District Scout Leader for the Cambridge Scouts in 1914. In 1910 he had formed the 9th Cambridge ‘Queens’ College Own’ Scout Troop mostly from the boys in the Chapel Choir. At that time each boy recruited for the Choir (from churches around the town) was entitled to a free straw hat each year. Wood diverted the ‘hat money’ into paying for the boys’ train fares to the annual camps. During the First World War, the Choir continued to function (though without many men to provide the Tenor and Bass parts); camps were still held but the boys on them were put to useful ‘war work’, most notably in 1917 picking fruit for Chivers and in 1918 flax, which was used to make the linen for aircraft wings. ‘Spanish Flu’ swept the camp, but all the boys (perhaps because they were out of doors and living in tents) survived. In 1923 Wood became Scout County Commissioner for Cambridgeshire and many scouting events were held at Queens’. He continued to run the 9th Cambridge Scout Troop until it was amalgamated with the 11th in 1960. Charlie Wood was also a very keen cross-country runner, winning a ‘Blue’ in 1897. Several of his trophies are still to be seen in the Old Combination Room. He donated other trophies to the Officer Training Battalions billeted in Queens’ during the War – one of these recently turned up in Australia. Andrew Munro was described in his obituary as “a Conservative of the right Cambridge breed” and apparently “used to admit, half in jest but also half in earnest, that he always voted against any change”. He was a Scotsman, born at Invergordon, Ross-shire. From 1886 till 1890 he was a student at Aberdeen University, where he took his M.A. It was not uncommon for promising Scots mathematicians to further their education by taking the Cambridge Mathematical Tripos after their first degree and Andrew Munro duly won a Scholarship in open competition and came up to Queens’ in 1890. He was Fourth Wrangler in the Mathematical Tripos (i.e. the fourth best first) in 1892. He served the College as Bursar, Steward and from 1931 Vice-President. For the first 20 years of his Fellowship he concentrated on his duties as College Lecturer, Director of Studies and Supervisor in Mathematics, working closely with his friend, the Senior Mathematical Lecturer and Senior Bursar, William Montgomery Coates. He made no original contributions to mathematics, seeing it as his primary duty as a College Teaching Officer to teach, but left lecture notes on a wide variety of subjects, all minutely indexed. He had an extensive library of all the latest maths books. His successor as Mathematics Lecturer, E.A.Maxwell, commented, “Pupils will remember his curious faculty, when presented with a problem new to him, of writing down seemingly irrelevant symbols, and suddenly (but almost infallibly) producing the answer”. His nature was essentially kind and sympathetic, but his view of pupils’ abilities was moderated by an instinctive prudence, “which prevented him from fostering undue hopes even in his most promising scholars”. When Coates died in 1912 Munro ‘inherited’ the post of Senior Bursar (as well as the guardianship of Coates’ children) and steered the College through financially difficult times. It was on his advice that, after the Great War, the College sold most of its farms and invested in Government stocks. The reserves which he built up enabled the College to expand in terms of both student numbers and buildings (the building of Fisher and the adaption of the old Fitzpatrick Hall for the JCR were started before he died). His obituarist in The Dial (A.B.Cook) attributed his successes as Bursar to a combination of financial acumen running in his veins (from his banking forbears), a distinct talent for maths and “an ultra-Scottish attitude of caution and reserve”. He was Senior Proctor twice, once for a two-year period in the midst of the First World War, a particularly difficult and traumatic period for the University. He regarded it as part of his duties to support undergraduates in all their pursuits and was often to be found at the football field or on the tow path. He remained unmarried, but one undergraduate of the time recalled that “In term time he was a celibate bachelor, but in the vacations he had lady friends in Paris” – perhaps an undergraduate rumour, but maybe the stolid image concealed hidden depths. On his death A.B.Cook wrote, “But if he cared for individuals much, he cared for the College more. Not only our prestige in the Senate House and our triumphs in the Tripos, but our place in the Leagues, our position on the River, our chances at Henley all meant much to him. And realising, as he did, that the College had suffered in the past from lack of wealthy benefactors, he set himself with silent determination, through long years of abstemious self-denial, to make good that defect and was able to bequeath to us and to those who shall come after us the most munificent endowments that Queens’ has ever received”.